electrical faults in electrical motors (e.g. eccentric rotor, broken armature) etc. How to determine the type and scale of a problem? 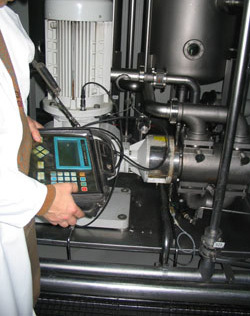 A time component and the frequency spectra of the vibration is recorded at the measuring points of the machine (commonly bearings) during normal operation conditions. By analyzing and evaluating the spectras the condition of the machine is determined along with mechanical defects if there are such. The determination of the defects is on the bases of the dominant frequencies on the frequency spectras and according to the differences on the time spectras. scale of defect (from the amplitude of the vibrations).